It's actually a floral arrangement, not jewelry. Used my imagination once I picked the ribbon, I picked the flowers to complement it. Well, I began making jewelry about 10 years ago. It is one of many crafts that I enjoy. I like to look at different items and then imagine it as a part of jewelry, be it, yarn, paper, plastic, metal, etc. Probably a magazine, I look at quite a few while I'm in the grocery store. If you mean any degrees, no. I pretty much look at something and then re-create it. I sew, but don't like to refer to the pattern. I pretty much know how it is supposed to look when it is finished and I just sew it. I believe years ago I came across Catalogs.com and their catalog was one that I could get for free. I don't order it anymore because it's too heavy (that's a new one), but it is pretty much like the office supply catalogs that I use at the office and so I chose not to order anymore. 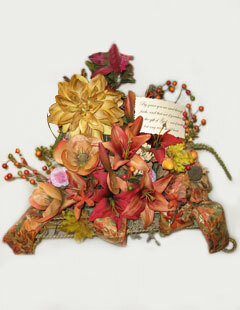 Greeting cards, crocheting, jewelry-making, floral arranging, creating shadowboxes, picture frames, etc. I look at jewelry items quite a bit, but sometimes it just gets to be too much and I start on another craft. I literally gave my granddaughter at least 1 million beads (no kidding) and she is now making jewelry. I usually participate in craft fairs. But, it depends on the entry fees as they can get a little ridiculous. Have fun. Look at everything with a different perspective. Whatever you desire to create, you can if you believe you can.